Across the county today, swimmers took advantage of the pleasant weather to set seven new NVSL records. At the Division 3 meet at Hunt Valley, Donovan Kovalsky of Mount Vernon Park took down Cyrus Hashemi's 11 year old 11-12 Free record of 26.44, hitting the wall in 26.20. The 8-year-old phenom Andy Li of Kent Gardens went two-for-two at the Division 7 meet hosted by Mosby Woods, setting new marks in both the Breaststroke (19.35) and the Butterfly (16.21). The previous Breast record was held by Blake Masden (19.77 in 2016) and Andy had the previous fly record of 16.37. Brandon Lesser of Daventry tied Charlie Greenwood's 37.28 in the Boys 9-10 Breaststroke, exciting the Division 16 crowd at Broyhill Crest. Charlie set his record at All Stars last year. At the Division 1 meet at Tuckahoe, Catherine Hughes broke her own 11-12 Breast record, besting her record of 34.63 with a 34.40. Also breaking a record at that meet was Tuckahoe's Nolan Dunkel in the 11-12 Fly. He outswam Max Cruz's 28.53, going 28.47. Rutherford's Aiken Do took down Anthony Grimm's one year-old 13-14 Breast record of 30.63 by touching in 30.41. He did it at the Division 8 meet at Waynewood. In the bright July sunlight yesterday, NVSL scholarship winners, swimmers and spectators reveled at the All Star Relays at Lincolnia Park. The host pool provided a welcoming environment for an estimated 4,000 people. On the deck just before the meet, NVSL athletes Hannah Karlin (Overlee), Mia Oppler (Walden Glen and Rolling Hills), Ian Peverall (Hollin Meadows), Hannah Rollins (Lee Graham) and Martin Salamone (Village West) were presented with the league's 2018 scholarships. Those 5 were selected from 52 applications! On the grass, dozens of colorful team and vendor canopies created a fun environment for everyone, including live video streaming on a big screen. A Channel 7 News crew roamed the area. And in the water, three league records were broken, starting with the first two events. In the Girls Mixed Age 200m Freestyle Relay, the Cardinal Hill team of Courtney Watts, Emma Watts, Maggie Shi, and Brynn Curtiswith excited the crowd with a 1:54.89, besting the old record of 1:55.09, set by Highlands Swim in 2016. Then in the Boys Mixed Age Free, the Hamlet team of Ryan Bradshaw, Alex Andrews, Johnny Bradshaw, and David DiMeglio destroyed their own record of 1:50.08 set just the week before, touching in 1:48.76. And in the Boys 15-18 200m Medley, Jaya Kambhammpaty, Tommy Hallock, Daniel Gyenis, and Noah Desman of Fox Mill Woods swam just under their own record of 1:44.79 (also set last week), hitting the wall in 1:44.67. The NVSL would like to thank the multitude of marshals, timers, RTOs, awards folks, clerks of course, stroke & turn judges, starters, referees, and of course, our spirited announcer Bob York for spending four hours on the deck making this meet possible. The league would also like to give a special thanks to the Lincolnia Park volunteers for all their prep work and dawn-to-dusk support yesterday. High Point Pool will be thier second annual HiPP-o-thon fundraiser to benefit the Warrior Canine Connection. The Warrior Canine Connection (WCC) is a pioneering organization that utilizes a Mission Based Trauma Recovery (MBTR) model to help recovering Warriors reconnect with life, their families, their communities, and each other. Supporting the WCC gives the High Point Swim Team an opportunity to work together, help recovering warriors, and teach our swimmers about giving back. The WCC will be present at the event, along with some of their service dogs! For more information go to the HPP website. WHEN: July 19, 7:30 - 10:30 a.m. Swim Ninja has partnered with Chesterbrook Streams to provide a live stream of the 2018 NVSL All Star Relay Carnival! The live stream can be viewed on SwimNinja.com with enhanced coverage of the event, or directly on the Swim Ninja youtube channel using this link https://www.youtube.com/channel/UCGRxsfk4_65TE6N7m_lmxbA/live - Check out these viewing options to experience all the sights and sounds from the day. Note that the link will not go “live” until just before the competition starts - so be patient for these very exciting races. Now you can cheer on your teams from the bleachers at Lincolnia Park or from the tent in your team areas OR from the comforts of home. Thank you Chesterbrook Swim Team for your volunteer and creative efforts to make this all possible! "2018 NVSL All Star Relay Carnival@LP" is also available on the Meet Mobile app. LP has generously offered parking in their back field to the first ~200 folks after 7am to those entering the parking lot an not leaving for the rest of the day. Enter the parking lot at the far side from the pool and following the guides where to park. Please do not park anywhere but where the guide lead you. The lot will close at LP's direction. 8-10 am - Moroccan Bites food truck. Offering Breakfast Boxes for convenience. Located by the pool - please patronize if you are there early. Are you ready for the League's biggest meet of the year?!!! Sixty-six of the one hundred and two teams will have relays competeing in tomorrows All Star Relays. Will more team and league records fall? Will the athletes have the fasted 'leg' they ever swum? Will they make memories with friends that will last forever? Answers: YES, YES, and YES !!! With an expected crowd of about 4500 people - be prepared for the meet by reviewing the Public Guide for 2018 ASR. Ben and Andrew Denman-Grimm are stand-out 14 year old twins who had quite a day with their teammates on Saturday at Vienna Woods. Ben's and Andrew's parent's are currently stationed in Switzerland for a two-year tour of duty. The Denman-Grimms are long time members of Vienna Woods. Ben and Andrew, who have been members of the swim team since being 8 and unders, love swimming "In the Woods" so much that they elected to stay in America with friends during the summer swim season. Wow! Did their dedication pay off. Ben broke a 9 year old record in the 50 free by going 25.40 and Ben, Andrew, Jack Peterson and Joshua Huang broke a 22 year old 13/14 Medley Relay record by going 56.06. This smashed the previous mark by 0.88 seconds! Great swimming boys! At one of only two remaining yard pools in the NVSL today, spectators at Kent Gardens were able to see not one but three league records set. Elise Mozeleski of Sully Station started the party by taking down Marshie Smith's 2000 backstroke record of 27.84, touching the wall in 27.34. In the very next event, the Boys' 8&Under Breaststroke, Kent Gardens' newcomer Andy Li earned his second NVSL record, destroying the old time held by both Steve Scannell (Fairfax, 1974) and Joey Spagnoli (Dowden Terrace, 1978), 17.37 vs. 19.10. Later, in the Girls' 9-10 Butterfly, both Katherine McArther (Sully Station) and Sophie Fredericks (Kent Gardens) outswam Kendall Vess's (CCH, 2016) 14.29. In a classic race, Sophie out-touched Katherine, 13.98 to 14.16. At Holmes Run Acres, the other NVSL yard pool, Elizabeth Bryan of Ilda swam 36.81 in the 9-10 Girls Breaststroke, besting Alison Queens' 2005 mark of 36.96. There was also some record-breaking action in the meter pools of Hamlet and Fox Mill Woods. Hamlet's mixed-age boys (Ryan Bradshaw, Alex Andrews, Johnny Bradshaw, and David DiMeglio) took down Fairfax's 2014 record of 1:49.74, touching in 1:49.40. Finally, Fox Mill Woods' Jaya Kambhampaty, Tommy Hallock, Daniel Gyenis, and Noah Desmand swam the 15-18 Boys Medley relay in 1:45.01, obliterating Tuckahoe's 1:46.02 set just last year. Ryan Bradshaw, Alex Andrews, Johnny Bradshaw, and David DiMeglio of Hamlet finished with a time of 1:50.08 surpassing the previous 2016 record which was also held by Hamlet. The Fox Mill Woods team of Jaya Kambhampaty, Tommy Hallock, Daniel Gyenis, and Noah Desmand pummeled their own record that they set just last year. The new record time is 1:44.79 which disappointed Overlee's team (1:45.89) and Chesterbrook's team (1:45.93) who also swam faster than the old record of 1:46.96. The matchup between these three teams will be one to watch at All Star Relays! Alexis Lee, Emmie Ridgeway, Elyse Hartmann, and Kate Bailey of Overlee finished in 1:53.00, crushing the old record of 1:54.63 set in 2017 by McLean. To add to their stellar night of swimming, the FMW team did it again. Jaya Kambhampaty, Daniel Gyenis, Noah Desman and Tommy Hallock beat their own 2017 mark of 1:35.80 with a new record swim of a smoldering 1:34.94. Michael Moriarty share this article, Shouts from the Stands, the Other Tiger Sharks via Twitter, but for those who have not seen it on the SwimSwam website - it is now accessible here. Mike Moriarty grew up in Falls Church and competed for High Point Pool from 1968 to 1978. Since 2000, he has been a member at Chesterbrook and among other roles, he was the Team Rep from 2006 to 2008. TONIGHT!! Have fun and swim fast! The times/results from the seventeen carnivals will be used to determine the teams going to All Star Relays which makes the verification of times on time cards doubly important. Timers should verify that their correct time is written on the timecard before clearing the watches. The selection meeting for the All Star Relay Carnival is scheduled for the evening of July 12th and afterward teams will be officially notified of their entries and can then start planning for the following Wednesday. Information about All Star Relays (hosted by Lincolnia Park) can be found in the All Star folder on our website. Prepare early and do not delay with your orders. Andy Li of Kent Gardens set a League Record at this weekend's meet at Mosby Woods in the 8 & Under Boys 25m Butterfly event with a time of 16.37 seconds. This surpases Fair Oaks' Anthony Grimm's time of 16.80 set in 2011. The Li family just moved to the area from Pittsburgh and Saturday was Andy's first A meet in the NVSL and KGRC's Team Rep says "He's a sweet kid with the eye of the tiger as he had already shown himself to be a fierce competitor on the Tuesday post-B meet floatie relays! We can't wait to see if other NVSL records are in jeopardy next week!" The Kent Gardens Dolphins have one more home meet, giving him an opportunity to break a pair of yard records. Then it's a final 25 meter A-meet and Divisionals to see if he can lower more meter records. Can we be only weeks away from seeing Roger McLeod's 1965 freestyle time be erased from the record boards?!! Welcome to the league, Andy! Back in early April, a "spectacular" fire swept through the Faircrest Community clubhouse in Centreville, injuring no one but damaging its pool's pumps, plumbing and bathrooms, leaving the Herndon league team without a pool for the summer. Mike Wiedemann, one of the Faircrest Cyclones' team reps, reached out to the NVSL for help, and within hours, both Brookfield and Little Rocky Run stepped up to offer their pools for Cyclones practice throughout the summer. Mike was so grateful, he sent a letter to the editor of the Connection newspaper, offering his thanks to the Brookfield Breakers for hosting his team for the summer. See the Cyclones article here: just-add-water. Thanks to both Little Rocky Run and Brookfield for displaying their "principles of good sportsmanship" as model members of the NVSL! Wear appropriate clothing and sunscreen. Choose lightweight, light-colored, and breathable fabrics, as well as broad-spectrum sunscreen (with protection from both UVA and UVB sun rays) to protect you and your child from the heat and potential sun-related skin damage. Hats and umbrellas can be used to limit exposure to harmful sun rays. Drink lots of fluids. Remember to drink plenty of liquids, regardless of your activity level. Fluids should be drunk before, during and after being exposed to extreme heat. Know how to identify heat-related illnesses. Learn symptoms and signs of heat-related illnesses/conditions such as heat stroke, exhaustion, cramps, and severe sunburn. If children show these symptoms, seek medical assistance immediately. It was a little damp, but we all survived Week One of dual meets!! ATTENTION HIGH SCHOOL SENIORS: There are FIVE $1500 NVSL scholarships that will be awarded this summer. Applications are due no later than 6 PM on June 29th. This year's essay asks “What Life Lessons Swimming/Diving in the NVSL has Taught Me”. Application is in the Document Center. WOW! - 788 parent-volunteers attended starter, referee, and stroke and turn certification clinics this year (many of them went to two clinics)! Besides the job of Clerk-of-Course, officiating is up there on the difficulty scale and probably number one on the un-appreciated ladder. Being a referee or a starter or a stroke and turn judge isn’t fun, but these roles are necessary to ensure all swimmers are treated fairly and abide by the rules. Those who disagree with our judges are strongly encouraged to join the ranks of officials whose NVSL season starts weeks early, attending clinics, downloading documents, and studying these rules and procedures. Thank you again to all officials - we couldn’t sit and cheer for our kids without you standing on deck and being neutral. Timers - At the completion of each event, each Head Lane Timer LEGIBLY writes the stopwatch times on the card, determines the official time, and LEGIBLY writes it on the card. Each lane timer views the recordings by the Head Lane Time for correctness before clearing his or her watch. All rule clarification questions should be directed to Pamela Stark-Reed at pesreed@yahoo.com and askNVSL@gmail.com. Catherine Hughes of Tuckahoe set a new 11-12 Girls 50m Breast record of 34.63 at Tuckahoe's Week 1 home meet against Langley. The old record of 34.84 was set by Emily Makin (MVP) in 2016. NVSL summer swim shifts into high gear this weekend with our first round of dual meets. Good luck to all teams and swimmers. Swim Fast. Demonstrate good sportsmanship. HAVE FUN!! Freestyle - Per the NVSL rules, freestyle may be swum in any manner (on the back, on the front, on the side, doing another stroke, etc.) and this rule includes the 'freestyle' leg of the Individual Medley event and the Medley Relay event. False Starts - After a swimmer is disqualified for a false start AND if the race has not begun, it is the rule that the swimmer is not permitted to swim in that event. No heckling allowed! If a storm is in the forecast for Saturday: The meet will go on while it's raining. Thunder and lightning is not acceptable - go to your cars and wait it out. COMMUNICATION is the key to avoiding conflict. Talk it out! All of the NVSL community would like to sincerely thank all of the pools that graciously hosted the NVSL clinics this year. Big shout outs go to: Mantua, Lee Graham, Shouse Village, Annandale, Fairfax Club Estates, Virginia Hills, Hunt Valley, & Sully Station. Thank you for all your support! See County of Fairfax Information Letter for regulations. No cost or registration is required; two hour clinic; DO NOT BE LATE. June 21st at 7:00 pm *Stroke and Turn RE-CERTIFICATION - ONLINE - Advance registration required at: REGISTER HERE *This clinic is intended for S&T Officials with 5 or more years of experience. Do not fear, the sunshine has been ordered and will arrive soon. NEVER go to another website again! The far right tab in our menu bar now has a FUN tool for you to use. Compete teams from any year and week with one another. Some meets go back to 2003. Get your NVSL Handbook from your Team Rep. This year, USA Swimming has given us permission to include the stroke rules in our book. Now EVERYONE will know the rules! FCPA wants to thank you for another successful winter swimming season. Even before our first dual meet, it is already time to begin thinking about the 2018/19 winter swim season. All bids are due by 8am on Thursday, July 5, 2018. Joshua Smith is the FCPA Pool Contract Coordinator and can be reached for questions at Joshua.Smith2@fairfaxcounty.gov. Tweet us photos and interesting news. DO NOT BE LATE for clinics. Clinics are approximately 2 hours. Although not a prerequisite, the NVSL Instructors highly recommend watching the USA Swimming Training videos at https://www.usaswimming.org/officials/officials-training-videos. Check officials' attendance and requirements to ensure proper certification. The third and final session of Hy-Tek training will include the Table Administration process and B meet instructions. A short discussion of the roles of Place Recorders and Verifiers will lead off this training and a table worker breakout session (optional) will move to another conference room. No cost or registration is required. PLEASE BE COURTEOUS TO INSTRUCTORS AND ATTENDEES BY ARRIVING EARLY. PLEASE DO NOT BE LATE. ...will be at the FCGC all day offering NVSL apparel and accessories. USA Swimming Rule books will be available for purchase. NVSL Handbooks will also be provided - but check with TR before taking one, due to limited supplies. The first of two Coaches Clinics is scheduled for May 19th at Shouse Village Pool. This is an outstanding clinic organized by the League and a team of great instructors with many years of coaching experience. This clinic is highly recommended for new coaches and for coaches new to the NVSL. Encourage your coaches to sign up at nvslcoachclinic@gmail.com for this great opportunity to learn new practice and training techniques, various ways to deal with situations, and ideas for making this season more fun than last. Send the "coach wanted" ad you want posted to askNVSL@gmail.com. If you have already posted an ad and the job position has been filled, please send a message so that it can removed. 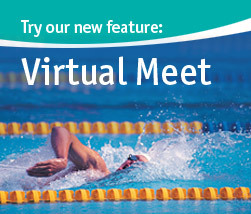 The Automation Committee will host a second training session for the computer software used in team and meet management on May 20th at Mantua Swim and Tennis Club. The training session will emphasize the practical usage of the software and will also expand the discussion on navigating the NVSL website in order to download necessary files. The session will begin at 3:00 pm with a brief presentation overview followed by practical training. Attendees are encouraged to bring their team computers for a hands-on help session after the training. Team representatives and new computer operators are encouraged to attend. No registration required. If you (Team Reps only) need a copy of the current Team Manager or Meet Manager software, the League maintains backup copies of the installation software to assist teams in restoring their copies of the software. Contact either Joe Mattis (jtmattis@cox.net) or Dan Joyce (dojgeg@verizon.net) of the Automation Committee to request backup copies of the needed software. Located on the website in the Team Rep folder. UPCOMING TRAINING CLINICS All clinics are free. No registration required. Happy Spring! Hope all is going well with your preseason preparations! We are excited to offer two dates for the NVSL Coaching Clinics this year. Team coaches are encouraged to sign up by emailing nvslcoachclinic@gmail.com. Include coach’s name, team, age group(s) coaching, prior years coaching experience and the date of the clinic. These clinics are open to jr. coaches as well as seasoned coaches. More info in COACHING CLINIC SIGN UP . If you have any questions, email nvslcoachclinic@gmail.com. Welcome to the 63rd season of the NVSL. Our WEBSITE – myNVSL.com: User ID and password requests (Team Reps only) for the website should be sent to askNVSL@gmail.com or Joe Mattis at jtmattis@cox.net. “What secrets are opened with a password?” you might be asking. Well, myNVSL.com offers Team Reps the ability to create a team website (announcements, calendar, documents, contacts, etc.) within the League’s website. The more common use of a myNVSL account is to download 2017 results (CL2 files) at the start of the season to get some intel on the new teams within your division. Review the "Join a 2018 NVSL Pool" document. Email any updates or edits. CLINICS and OFFICIALS: We will continue to have the Officials’ Attendance Information online and it will be updated accordingly. Questions regarding attendance should be directed to Dave DiNardo at 301-520-6209 or dave.dinardo@gmail.com. COACHING ADS: Send the ad (Word format) that you want posted under the "COACHES" tab to askNVSL@gmail.com and it will be added. If you have already posted an ad and the job position has been filled, please send a message so that it can removed. The rule change proposal votes are in. Remember: Adopting a new rule requires a two-thirds (66.7%) favorable vote of the Team Reps present and voting. The submitted Rule Change Proposals can be found here. Our Seeding Meeting officially kicks off the season and it is scheduled for Sunday, February 25th at Hayfield Secondary School, 7630 Telegraph Road in Alexandria. The meeting begins with our New Team Rep clinic at noon and runs approximately one hour. We encourage all new Team Reps to attend this important clinic. All Team Reps should report by 1:00 pm to register and to pick up their team packets and meet with the NVSL vendors. Our regular session meeting will begin at 2 pm, and at 3 pm, you will meet with your Division Coordinator to finalize the season's schedules. Team Rep contact information will be collected at the Seeding Meeting. - If your pool is interested in hosting a divisional meet, make sure you check with your pool board before the meeting if you need to receive permission. Divisional Relay Carnival is on July 11th and Individual Divisionals is on July 28th and the rain/thunder date for Relay Carnival is on July 12th. - Again this year, you may order 25, 50, 75 or 100 Handbooks at no cost. Please place your order at the meeting. - Are you still in need of a coach? If so, it is not too late to post a job advertisement on the NVSL website. Just send the ad (Word format) that you want posted to askNVSL@gmail.com and it will be added to the NVSL website. If you have already posted an ad and the job position has been filled, please send a message so that it can removed. - The document currently named "Join a 2017 NVSL Pool" gets updated yearly. It is provided to people when questions are asked about joining one of our League pools. Please review this document and provide your updated information. - Carefully read through the 2018 rule change proposals. - If you have comments and/or questions, email askNVSL@gmail. - Please use restraint at the meeting - don't repeat or state the obvious. - Discussion will be controlled by a monitor (no rambling). - A single written voting ballot will be used for submission of votes. - A Rules Meeting will be scheduled for March 11th if we are unable to complete the process in the allotted time. Note: Seeding Meeting is for Team Reps and invited guests only. Happy NVSL off-season and get ready for the cold weather approaching. The League calendar is loaded to our website (look left on this page). The first dual meet is on June 23rd and All Stars on August 4th. The February Seeding Meeting is scheduled for February 25th at Hayfield Secondary School. Are you exiting your position as Team Rep? Let us know and please provide a name and an email of your successor to askNVSL@gmail.com. Take note that most information will be posted here. If you need a coaching ad posted on the website, email a Word document to askNVSL@gmail.com and it will be posted for you. The League proudly boasts 15,991 swimmers for 2017. 1027 official were certified at NVSL clinics. In 1978, the Mosby Woods timers arrived at the Saturday dual meet with digital watches instead of the standard mechanical stopwatches. The issue, “Watches Create Flap Within NVSL Ranks” made the Washington Journal. $20 was the bill for team dues in 1959. Keep swimming and thank you all for volunteering your time and service to the NVSL. Send questions or suggestions to askNVSL@gmail.com. The 2017 NVSL Team Representative’s End of Year meeting will be held on Sunday, September 10th at the Mason District Government Center (6507 Columbia Pike, Annandale, VA 22003) beginning at 6:30 pm. At the meeting we will recap the 2017 season and look forward to next summer. It is anticipated that topics to be covered will include reports on: financial data, insurance, protests, sportsmanship, All Stars, awards, 2018 calendar, hytek, surveys, and the website. We also hope to get feedback on any issues of interest to the League from the 2017 season and for the 2018 season. Congratulations to our 2017 Sportsmanship Award recipients. Sully Station hosted a fabulous end-of-the-season meet today, with great weather, amazing vendors, and entertaining live interviews on a Jumbo-Tron. The meet was capped with an NVSL-record swim by Donaldson Run's Charlie Greenwood, whose 37.28 set a new mark in the 9-10 Boys 50m Breaststroke, breaking Johnny Bradshaw's 37.36 from 2014. Congrats to Charlie and the rest of the league's swimmers, parents and coaches, and we can't wait till next year! All Star photos will be available for download at https://nvslallstars.smugmug.com. Check with your Team Rep for details. Isn’t this League great?! I hope it was a summer to remember. Congratulations to all swimmers who achieved their goal this summer: team record, personal best, first A-Meet, legal time in the breaststroke, swam a 50 butterfly, showed good sportsmanship, made some new friends, and more. Huge thanks to the parents, coaches, team reps, officials, meteorologists, and Division Coordinators for making it all work. - If any of you discovered missing awards – stop by Sully Station Pool on Friday from 8 am to noon. - Team Reps – complete and turn in the Seeding Survey so that next year can be even better. Also the Meets Worked Spreadsheet. Capping an already memorable year, Fair Oaks's Anthony Grimm took down the NVSL Boys 13-14 IM record at the Division 5 Individual Championships yesterday, held at Cardinal Hill. Already owning the Fly, Back and Breast records, Anthony's 59.15 bettered Peter Makin's 2016 time of 59.50. Amazing. Memories in the making - 2017 Divisionals - in the rain here we come! Put on those rose colored glasses and that contagious smile! Yes we do swim in the rain! - Please plan your driving route carefully to avoid low lying roads that might flood. - Pack several dry towels and sweatshirts, ... at least it's not hot and humid! - Be Prepared, Swim Fast and Make Marvelous Memories! Tue, 7-25-2017 | Amy M.
High Point Point conducted a swim-a-thon to benefit Wounded Warrior Project. The team completed nearly 120 miles of swimming and has raised more than $6000 for the charity. 113 swimmers swam 116.78 miles, surpassing their 100 mile goal, and receiving approximately $7,500 in pledges. Jamie Lindly, Captain, USN, father of Jack and Abby, and Mike Burris, LT(SEAL), USN (Retired), father of Adam and Ryan, kicked off the event with words that helped connect our swimmers to the organization for which they were swimming. Donations are being accepted through Saturday, July 29. You can make a donation online @ High Point Swim-a-Thon. Anthony Grimm of Fair Oaks had a banner day on Saturday at his home pool. The 13-14 boy broke both his own 50m Butterfly NVSL record (25.88 versus 26.37), but also took down Leo Wang's (Virginia Run) 2014 50m Breaststroke league record of 30.90, touching in 30.63. Elizabeth Bryan of Ilda now stands alone as the greatest NVSL 8 and under 25m breaststroker, surpassing her own shared record with Amy Rymiszewski of 19.98. Elizabeth swam 19.61 in her home pool. The McLean 13-14 Girls (Olivia Brower, Dora Wu, Ulaina Ahn, and Skylar Tennant) finished up their relay season with a bang. At their meet at Tuckahoe, they took down Overlee's 2014 100m Medley NVSL record of 58.43, finishing in 57.57. Finally, a very unusual race happened in the Boys 13-14 100m Medley when Fox Mill Estates visited Waynewood on Saturday. Not only did Waynewood win with a team record 59.78, but the Fox Mill Estates boys also took down a team record, going 1:00.53. Once the times were posted, cheers erupted from all the spectators. Congratulations to the Waynewood boys (Matthew Morris, Alexander Micheli, Hain Henderson and Aidan Lansburgh) and the Fox Mill Estates boys (Kyle Diederich, Thomas Carney, Joe Zecher and Tommy Allison). At Greenbriar on Wednesday, over 1000 swimmers and many more spectators withstood the oppressive heat and witnessed some great races. First, in the Girls 15-18 200m Medley Relay, the Overlee team of Mary Kate Reicherter, Kayle Park, Eleanor Ridgeway and Michaela Morrison bettered their record from the previous week, 1:59.68 versus 1:59.78. They are the first relay to break the two minute mark in this event. In the following boys 15-18 medley event, an epic, water-churning showdown resulted in the two fastest swims in NVSL history. Though the Overlee boys set the new record just a week before, they could only muster a 3rd place with a highly respectable 1:47.58, just 0.07 seconds off their record time. Second place went to Tuckahoe's Peter Byman, Carter Flint, Paul Boyce and Chase Brown in 1:47.35. But both fabulous teams were outswam by Fox Mill Woods's Jayaprakash Kambhampaty, Adi Kambhampaty, Thomas Hallock and Daniel Gyenis, touching the wall in a phenomenal 1:46.96. In the second half of the meet, two freestyle relay records were broken. The Chesterbrook girls' 11-12 team of Maria Alvarado, Cate Sheridan, Patricia Leonard and Caroline Burgeson took down the record of 54.22 by one one-hundredth of a second. The old record was held by Overlee's 2016 team. As the sun mercifully set, the final race again featured the amazing Fox Mill Woods 15-18 boys, who completed their double with a 1:35.80, destroying their old record of 1:37.12, set the week before. 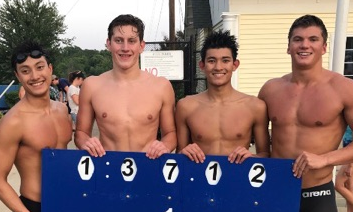 At the All Star Relay Meet held yesterday at Greenbriar Pool, the 15-18 Boys Relay Team from Fox Mill Woods Swim & Racquet in Reston broke two League records. In the 15-18 Boys 200M Medley Relay, the team comprised of Jaya Kambhampaty, Adi Kambhampaty, Tommy Hallock and Daniel Gyenis, earned a time of 1:46.96. This same team, then went on to win their second race, the 15-18 Boys 200M Free Relay, with a time of 1:35.80. The team broke their own record of 1:37.12 set last week at the NVSL's Division 9 Relay Carnival on July 12. League records aren't made often and having two such records broken by the same team in a championship meet is a remarkable accomplishment. The team members include Jaya Kambhampaty, 17, a senior at Washington and Lee High School, Daniel Gyenis, 16, a junior at Oakton High School, Adi Kambhampaty,15, a sophomore at Washington and Lee High School, and Tommy Hallock,18, a recent graduate of Oakton High School and a soon to be freshman at Virginia Tech. Fox Mill Woods has a current season record of 3-1 and was named the Division 9 Relay Carnival champions last week. At High Point Pool today, Fair Oak's Anthony Grimm bettered Max Cruz's 13-14 50m Backstroke record with a 26.19, crushing Max's 2015 time of 27.28. At Tuckahoe, there was an epic Boys 15-18 200m Medley race. Tuckahoe's Peter Byman, Carter Flint, Paul Boyce and Chase Brown outswam Overlee's Nick Pasternak, Paul Kinsella, Jonathan Day and Sam Ellisonold, 1:46.02 to 1:46.51. Both broke Tuckahoe's Week 1 record (1:47.44). A few minutes later, the Mixed Age girls from Tuckahoe, Catherine Hughes, Danielle Hughes, Carolina Zubler and Evie Gieseman broke Highlands Swim's 2016 time of 1:57.09, blazing to a new record of 1:55.96. It was a torrid night for the 2017 Division Relay Carnivals across the county and full of exciting races and great sportsmanship! At the same D1 carnival, the Girls 13-14 200m Freestyle Relay's sweltering time of 1:54.63 was swum by McLean’s Dora Wu, Natalia Rongione, Olivia Brower, & Skylar Tennant, breaking the old League Carnival record of 1:54.92 (Mosby Woods, 2016). Hot on McLean’s tail was Overlee’s relay of Kate Bailey, Alexis Lee, Emilia Ridgeway, & Alice Bruce, touching second in a time of 1:54.77. As for the 15-18 guys – six teams blistered past the fastest times in League history but only two relays will be named the League Record Holders. The Boys 15-18 200m Medley Relay's old record was incinerated by four teams. Overlee’s Nick Pasternak, Paul Kinsella, Jonathan Day, & Sam Ellison took home the top spot with a new record of 1:47.51. In the last event of the evening, Fox Mill Woods was determined to set the new 15-18 Boys 200m Freestyle Relay. Jaya Kambhampaty, Daniel Gyenis, Adi Kambhampaty, & Tommy Hallock steam past the old to a new record of 1:37.12. Peter Byman, Paul Boyce, & Carter Flint. At Ilda Community this morning against Long Branch, Elizabeth Bryan tied a 32-year old record in the 8&U Girls 25m Breaststroke, matching Amy Rymiszewski's time of 19.98. Fair Oak's Anthony Grimm broke Andrew Seliskar's 13-14 Boys 50m Butterfly, touching in 26.37 at Cardinal Hill. Andrew, now swimming for Cal, had a time of 26.40. Well done Elizabeth and Anthony! Zoe Dunn of Holmes Run Acres set a new record in the 9-10 girls 50 Yard Backstroke with a time of 32.68 seconds at her team's Divison 14 meet against Ilda. The old record of 33.90 dates back to 1983, when Ronald Reagan was president during the Cold War, and Sally Ride became the first American woman in space. Congratulations Zoe - keep those fast swims coming!! The first week of the 2017 season kicked off with a bang, as Virginia Run’s Charis Roundtree set an astounding new NVSL record of 15.25 in the 8&U 25m Freestyle, swimming a home meet against Vienna Woods. The old record of 15.48 was set by Amy Rymszewski in 1985. Amy’s record was one of the two oldest girls’ meter records in the NVSL. Across the county at Tuckahoe, the home team 15-18 Boys Medley Relay of Peter Byman, Carter Flint, Paul Boyce, and Chase Brown set a new league record of 1:47.44 in their meet with Wakefield Chapel. The old record of 1:48.16 was set by McLean in 2015. Please remember the deadline for submission of a 2017 NVSL Scholarship Applications is June 30th FIVE scholarships will be awarded this year - each valued at $1,500. Anyone interested in competing for an NVSL Scholarship must submit their application to the NVSL Scholarship Chair, Jack Schaeffer before 6 pm on June 30th. For questions contact nvslscholarship@gmail.com. June 18th: Stoke and Turn Clinic at Hunt Valley Pool at 9:30 am. June 18th: Referee/Starter Clinic and New Starter Clinic at Mantua Pool at 9:30 am. June 21st: Stoke and Turn Clinics at Sully Station Pool and Hunt Valley Pool, both begin at 7 pm. Want to swim in the NVSL? Join an NVSL pool near you. The League will hold its 62nd Seeding Meeting on February 26th! The Seeding Committee places the 102 NVSL teams into divisions for the upcoming swim season. Seeding of these teams is a complex, deliberative and in-depth process. Historical data, including meet scores and previous won-loss records, are important inputs to the evaluation process, as is information provided by the Team Reps and the Division Coordinators. Each team is measured against every other team in the League. Ultimately, the teams must be in placed in 17 six-team divisions. The goal of seeding is to have the most competitive meets possible in which the final scores are decided in the relays. It is with a heavy, yet full, heart that I announce the closing of Aardvark Swim & Sport. After over 30 years of running a successful and fulfilling business, I have decided that it is time for me to retire. I feel that the time is right to move on to the next phase of my life and focus on my family, health, and coaching my swimmers. I wanted to take this moment to let you all know that I valued both our business relationships and friendships throughout these 30 years. I appreciate the trust that you have put in me and my company. I hope that you understand the seriousness with which I treated our relationships and know that the internal struggle I faced while making this decision was not one that I made easily or lightly. I cannot thank you enough for the support and kindness you have given Aardvark and myself over these many years, it has been appreciated more than I will ever be able to fully express. I look forward to a happy and peaceful 2017. Congratulations to our 2016 Sportsmanship Award recipients. Sandy has been a member of the Homes Run Acres swim team for the past 13 years. She has been to All Star meets on several occasions and has been selected as her team’s MVP multiple times. Sandy is a recent graduate of the Falls Church HS where she was involved in numerous extracurricular activities. As a member of her Varsity Cross Country Team, swim, soccer, and indoor/outdoor track and field HS teams she was selected as a captain for her swim team and an all conference and state athlete in a number o fother sports. Sandy attended the ALA Virginia Girls States, a mock government program, where she was elected to the House of Delegates. In addition, she served as a junior coach, lifeguard, camp counselor, and participated in numerous HS clubs (robotics and technology). Sandy will be attending Duke University in the fall. Kirsten is a 13 year member of the of the Burke Station Swim team. She has been the female high point scorer for her team and holds several pool records. Kirsten has served as both an assistant coach and an off season conditioning coach for the Burke Swim team. She is highly regarded by coaches and parents alike as a leader and a role model. Kirsten attended Lake Braddock Secondary School where she was a member of the swim and outdoor track and field teams. As an accomplished vocalist, Allison held lead roles in school musical and theater productions as well as sung the National Anthem at many A/B meets. She was selected to participate in the Fairfax County Youth Leadership Program and West Point Leadership Conference representing her HS. Kirsten will be attending Elon University in the fall. Maureen has been a member of the Greenbriar Swim team for the past 15 years. She is admired on her team for her spirit, leadership, and dedication to the sport and has received several awards through her pool and community . She has been involved in coaching with the team for the past four years as a developmental coach and the head coach for the winter program. Maureen developed and coordinated several fundraisers for worthwhile health foundations. Maureen attended Bishop O’Connell High School where she was a member of the swim team and was involved in numerous extracurricular activities including: National Honor Society, National English Honor Society and National Spanish Society to name a few. She peer tutored in Spanish and mathematics. Maureen will be attending the University of Virginia in the fall. Ashley has been a member of the Fairfax Station Swim team for the past 13 years. She has earned several team and coaches awards and attended several relay and individual All Star meets. She served as the Head Mini Team Coach for her team. Ashley created and coordinated several biathlon fundraisers at her pool in supportof several worthy foundations. Ashley attended Robinson Secondary School where she swam for the swim team for four years, qualifying for district finals in two of these years. She was a member of National English Honor Society, National Honor Society, and a member of the school’s literary magazine as well as the school’s Chamber Orchestra. Ashley worked as a lifeguard and assistant managerofher pool and as a religious aide at her church. Ashley will be attending University of Virginia in the fall. At Little Rocky Run today, three breaststrokers set NVSL records before the oppressive heat appeared to drain some energy from later swimmers. Blake Madsen of Poplar Tree started off the meet by breaking his own record from last week, becoming the first 8 and Under in league history to break 20 seconds in the Breast. Blake's 19.77 was an impressive drop from his 20.15 the week before. Emily Makin of Mount Vernon Park touched the wall in 34.84 seconds in the 11-12 Girls 50m Breast. She broke the old record of 34.88, held jointly by legends Lindsey Ertter (1995) and Ashley Danner (2003). Jacquee Clabeaux of Greenbriar then took over Ashley Danner's final NVSL record, touching in 31.62 in the 15-18 Girls 50m Breast. Ashley's old record was 32.01 set in 2007. Jacquee also holds the NVSL 9-10 Girls 50m Breaststroke record. A big thanks to ABC 7 meteorologist Brian van de Graaff of Little Rocky Run for allowing the meet to finish before the storms arrived! Enjoy the rest of your summer and we'll see you in 2017! At the Division 1 Individual Championships at Tuckahoe, Courtney Watts of Highlands Swim broke Isabella Rongione's 9-10 Girls Freestyle 2010 record of 29.78, touching the wall in 29.58. She then doubled up Isabella's 2010 1:13.86 IM record, swimming 1:13.20. At the Division 2 Championships, Johnny Bradshaw of Hamlet also pulled a double record-break, setting league records at his home pool in both the 11-12 Boys Breaststroke and Individual Medley. His 32.99 Breast broke his own record of 33.07 set two weeks prior, and his 1:05.56 in the IM bested Peter Makin's 2014 record of 1:05.92. The same day Peter Makin of Fairfax lost his 11-12 IM record, he set a new one in the 13-14 Boys IM. His 59.50 at the Division 3 Championships at Vienna Woods was the first time in league history that a 13-14 boy broke one minute in the 100 IM. The previous best of 1:00.29 was held by Andrew Seliskar, who finished 7th at the U.S. Olympic Trials in the 200 IM last month. Finally, at the Division 4 Championships at Virginia Run, Blake Madsen of Poplar Tree broke the 8 & Under 25m Breaststroke record, touching in 20.15. Evan Ingraham set the previous record of 20.48 last year. Watch for Peter and Blake as they attempt to break their own records at this Saturday's All Star meet at Little Rocky Run. At Chesterbrook today, the home pool's 9-10 Girls 100m Medley Relay team of Patricia Leonard, Eli Leonard, Keira Gutierrez and Madie Turley swam 1:07.34, besting the previous NVSL record of 1:07.70 set by Highlands Swim in 2015. John Schaefer, Jackson Steider, Joseph Schaefer and David Herbert of Wakefield Chapel touched in 1:50:53, but they weren't as fast as Johnny Bradshaw, Ryan Bradshaw, Alexander Montano and Chase Bradshaw of Hamlet, who finished in 1:50.34. The previous record was 1:50.65, set by Chesterbrook in 2013. The Vienna Aquatic team of Darby Galbraith, Anna Keating, Anna Sullivan and Tess Wilhelm destroyed Tuckahoe's 2007 record of 2:07.52, touching in 2:04.41. The very next event also featured the two fastest swims in league history, with Rutherford's Gabriel Rupar, Tate Hoffman, Niko Sanchez and Aiken Do out-touching Fairfax's Justin Connors, Christopher Dobrydney, Graham Evers and Justin Singletary, 53.26 to 53.71. The Fairfax boys had held the previous record of 53.83 for just one week. The Mosby Woods team of Eleanor Monnig, Alexandra Martschenko, Sara Tuo and Leaya Ma swam fast enough to set the new mark of 1:54.92, bettering Crosspointe's 1:54.98, from 2015. At his home pool today, Johnny Bradshaw of Hamlet crushed the 11-12 Boys 50m Breast NVSL record, touching in 33.07, more than a second faster than Adi Kambhampaty's 34.21 set in 2014. Also today, Tommy Hallock from Fox Mill Woods broke not one, but two league records at the 25 yard pool at Holmes Run Acres. Hallock swam the 15-18 Boys 50 Y Free in 21.48, beating an 18-year-old record of 22.10 set in 1998 by Chris Lengle of AF. He followed up this achievement just a short time later by breaking another record in the 15-18 Boys 50 Y Back with a time of 24.67. The prior record of 25.19 was set in 1999 by Greg Landrum of SRA. The rains held off on Wednesday night in NoVA, and the relay teams took advantage with some fantastic record-breaking swims. 1) The Highlands Swim Mixed Age Girls 200m Free Relay (Bridget O’Shaughnessy, Courtney Watts, Allison Martin, and Xenia de Cazotte) touched in 1:55.09 . The previous record was 1:56.80 held by McLean from last year. 2) The Overlee 15-18 Girls 200m Medley Relay (Suzanne Dolan, Kayle Park, Ellie Ridgeway, and Katherine Lundy) finished in 2:00.21, crushing the old record of 2:01.23 set by Orange Hunt last year. 3) The Chesterbrook 13-14 Boys 200m Free Relay (Ollie Bernasek, Andrew Bernstein, Nick Spicer, and Adi Kambhampaty) swam a 1:44.09, beating the previous record of 1:44.40 held by Fairfax since last July. 4) The Overlee 15-18 Girls 200m Free Relay doubled up their Medley record by touching in 1:49.44, destroying the old record of 1:51:22 set by Donaldson Run back in 2006. 5) The Overlee 15-18 Boys 200m Free Relay (Sam Ellison, Jonathan Day, Nick Pasternak, and Ryan Baker) followed up a couple minutes after the Overlee Girls, finishing the meet with a 1:37.73, breaking the previous record of 1:37.92 set by Highlands Swim in 2009. At the Division 3 Carnival at Lee Graham, the 11-12 Fairfax Boys (Justin Singletary, Justin Connors, Christopher Dobrydney and Graham Evers) also had a record-breaking double, finishing the 100m Medley in 59.18 and the 100m Free in 53.83. The old records were 59.76 and 54.43 set by Chesterbrook in 2012 and 2014, respectively. Courtney Watts of Highlands Swim broke her own 9-10 Girls 50m Back record of 33.64 set in Week 1 by swimming a 33.16 today at Tuckahoe. Courtney wasn't done setting records, however. In the relays, she and her teammates (Skylar Sunderhauf, Allison Martin, and Xenia de Cazotte) destroyed the Mixed Age Girls 200m Free Relay record with a 1:57.09 while defeating the Tuckahoe girls, who had held the record of 1:58.45 for just one week! What a race! It only takes a little to break a record, and that it what the team of Lily Flint, Catherine Hughes, Natalie English, and Evie Gieseman from Tuckahoe did to establish the new Saturday A-Meet Mixed Age Girls 200 meter Free Relay Record in their home meet on Saturday. The new record now stands at 1:58.45, which betters the 1998 Vienna Woods record of 1:58.46 by one one-hundredth of a second. Congratualtions on this historic swim! Week 1 of 2016 was highlighted by an ever-improving standout and the falling of two old-school yard records. At Chesterbrook, Courtney Watts of Highlands Swim lowered her own 9-10 Girls 50m backstroke record of 34.16 set at last years All Stars by swimming a 33.64. She's got several more meets to lower that amazing time even further. Then, at Homes Run Acres, one of only two remaining 25-yard pools, Kendall Vess of Country Club Hills broke the record set by Gayle Smith (T) in 1978 and equaled by Erica Bledsoe (O) in 1982 of 14.30 by swimming a 14.29 in the 9-10 Girls 25Y Butterfly. Just for reference, in 1982, a postage stamp was 20 cents, a gallon of milk cost $1.85, and the first CD player was sold. Finally, at Kent Gardens, the other NVSL yard pool, the Oakton 15-18 boys (Drew Weber, Andrew Sargent, Michael Ambrose, and Brendan Power) took down the 200Y Medley Relay set by Somerset-Olde Creek on 7/2/1983 of 1:42.10 by swimming a time of 1:41.31. Witnessing that swim was Mark Klopfenstein, the breaststroke member of that SOC team and now the Oakton Dive Team Rep, and his mother, Linda Klopfenstein, who was SOC Team Rep at the time and is currently the Division 1 Coordinator. Please remember the deadline for submission of a 2016 NVSL Scholarship Applications is July 1, 2016. Four scholarships will be awarded this year - each valued at $1,500. Anyone interested in competing for an NVSL Scholarship must get their application to the NVSL Scholarship Chair, Jack Schaeffer before 6 pm on July 1st. For questions contact nvslscholarship@gmail.com. June 26th at 8:00 AM at Lee Graham Pool. See flyer. Please sign up via email: nvslcoachclinic@gmail.com and include coach name(s), email addresses, age group(s) will be coaching, and years of coaching experience. Send your ad to askNVSL@gmail.com and they will be posted ASAP. Two NVSL records were broken before a large crowd at Little Rocky Run yesterday, before the heat kicked in full. Janet Hu, now swimming for Stanford University, was on hand to present Courtney Watts of Highlands Swim with her first place 9-10 backstroke medal, fitting because Courtney had just broken Janet's record 34.32 set in 2006. Apparently several selfies were taken to celebrate the event. Amazingly, Courtney is only 9, and will be able to lower her own record 34.16 next year. Three events later, Max Cruz of Holmes Run Acres lowered the boys 13-14 backstroke record with a 27.28, just faster than Jaya Kambhampaty's 27.31 set last year. Max is also on the younger half of his age group, and should be a major force next year. NVSL Division Sportsmanship Awards were awarded at all Divisionals meets on Saturday July 25, 2015. The award is presented annually to one team in each division that best exemplifies the principles of good sportsmanship as embodied in the NVSL Standards of Conduct. Each team in the division casts three ballots: one based on the vote of the Team Representative, a second based on the vote of their coaches, and a third based on a vote of the 13 & over team members. Hollin Meadows and Rolling Hills now join Kings Ridge in having won the Sportsmanship Award 4 of the last 5 years! 3 teams won for the second year in a row: Hunt Valley, Little Rocky Run, Rolling Hills! Of the over 9000 splashes at the 17 divisional championship meets yesterday, two will stand out in NVSL history. Evan Ingraham of Overlee broke a 35 year-old record in the 8 & under breaststroke, besting Matt Buckley's 20.50 with a 20.48. And Katie Mack of Hunter Mill set a new record in the 13-14 girls IM with a 1:03.70. Cassidy Bayer of Mount Vernon Park held the previous record with a 1:04.02, set in 2013. The oldest boys' meter relay record on the books went down on Saturday, as the 8 and unders from Overlee (Evan Ingraham, Matthew Aslaksen, Rory McNamara and Billy Weber) swam their four free legs in 1:09.10 at their home pool, besting the mark of 1:09.84 set by Sleepy Hollow Bath in 1992. Jordan Parry, one of the 2006 record holders of the 11-12 girls NVSL A-meet relay, was at Tuckahoe Saturday to witness her best-ever time go down in flames, as the McLean team of Samantha Gonzalez, Dora Wu, Olivia Brower and Skylar Tennant obliterated the Fairfax Station record of 1:02.21 (held by Maggie Rogers, Jordan and Taylor Parry and Caitlin Rider) with a wicked 1:00.66. Like the Highlands Swim 9-10 girls, the McLean girls now hold the relay Grand Slam: all three NVSL relay records in their age group. The Overlee 15-18 boys, Ryan Baker, Brady Almand, Jonathan Day and Nick Pasterna, may have held the NVSL record for a few minutes, but their 1:48.32 was only the second fastest relay swum on Saturday. The McLean boys (Christopher Murphy, Ryan Lucas, Andrew Seliskar and Timothy Wu) cruised to a 1:48.16. Both teams beat the previous record, 1:48.52, set by Chesterbrook in 2014. At Hunt Valley on Wednesday, six relay teams made NVSL history. Starting in Event 1, the McLean mixed age girls (Dora Wu, Victoria Valco, Olivia Gore and Isabella Rongione) just barely out-touched the Hunter Mill girls (Alexandra Dicks, Katharine Frothingham, Katie Mack, and Julia Capobianco), 1:56.80 to 1:56.86. Both teams bested Tuckahoe's previous record of 1:57.06 from 2010. Then, in the 15-18 girls medley relay, Allison Wells, Christin Swanepoel Stevens, Allison Goldblatt and Robyn Dryer of Orange Hunt swam an impressive 2:01.23, just ahead of Tuckahoe's 2009 mark of 2:01.46. In the freestyle relays, 4 more records went down. First came the 9-10 girls of Highlands Swim (Aminata Davis, Maria Alvarado, Courtney Watts, and Bridget O'Shaughnessy), who broke their own 58.80 record from Divisional Relays with a 58.43. Then, Skylar Tennant, Samantha Gonzalez, Natalia Rongione and Dora Wu of McLean broke their own 11-12 girls record with a 55.03, and giving Dora Wu her second NVSL record of the day. Two events later, Kyrsten Davis, Kelly Derasmo, Shine Peng, and Maddie Heilbrun of Crosspointe touched the final wall in 1:54.98, bettering Donalson Run's 1:55.32 from 2003. Finally, the 13-14 boys of Fairfax (Ian Vollmer, PJ D'Alessandro, Kent Codding, and Peter Makin), swam 1:44.40, crushing Chesterbrook's 1:46.08, set just last week. At the Division 1 Relay Carnival on Wednesday July 8th, the looming skies failed to keep 5 NVSL records from going down. The first record fell in the 9-10 girls medley relay, when Courtney Watts, Hanna Boughanem, Maria Alvardo and Maggie O’Shaughnessy of Highlands Swim blazed to a 1:05.77, crushing the previous mark of 1:07.64, set by Mount Vernon Park in 2010. Two events later, the McLean 11-12 girls (Samantha Gonzalez, Dora Wu, Olivia Brower, and Skylar Tennant) finished in 1:00.21, annhiliating the previous time of 1:01.80, also held by MVP since 2012. When it was time for the free relays, the HS 9-10 girls and McLean 11-12 girls each completed their double breaks. Highland's Aminata Davis, Maria Alvardo, Courtney Watts and Bridget O’Shaughnessy took down the previous mark of 1:00.52 (held by CB since 1999) with an eye-popping 58.80. The McLean girls then finished their evening with a bang, when Skylar Tennant, Samantha Gonzalez, Natalia Rongione and Dora Wu went 55.16, outswimming the mark of 55.90 held by Overlee for over 30 years. The final record of the meet came when Chesterbrook's 13-14 boys (Ryan Soh, Jack McManus, Ollie Bernasek and Thomas Outlaw) re-broke the record that CB set just last year, topping their 1:46.69 with a 1:46.08. When Coach Chris Natoli told the girls to get ready for the meet, they thought he was just trying to psych them up to get ready for Divisional Relays. Orange Hunt and Rolling Forest had moved their meet to Friday due to the holiday weekend so on Thursday, he told them to get ready to practice the relay. He had them work on relay starts until they had them down to perfect timing since he knew that would make a huge difference. The day of the meet, the weather was perfect and the girls decided to go for it. Allison Wells, who is one of the fastest backstrokers in the NVSL this year, started off with a great backstroke leg that quickly set the pace. "Being able to have the opportunity of being on a relay with some of closest friends and breaking the record so early on in the season motivates to keep working hard and to keep improving." said Christin Swanepoel Stevens who swam an incredibly fast breaststroke leg of the 200M relay. "I think seeing each other work hard every single day has ultimately made us more accountable to each other." The fly leg of the relay was swam by the youngest member of the relay team, Allison Goldblatt. As Goldblatt entered the water, the crowd began to sense that team may actually break the record today and the cheering grew louder. She continued the fast pace set by the previous two swimmers. "We felt the energy of the whole team behind us during the swim and that made us push that much harder. Also, Rolling Forest was a great host pool and was very supportive of us as well." said Robyn Dryer who swam the freestyle leg with a lightning split of 26.4 seconds to clinch the record breaking time. The 15-18 girls set the new record with a time of 2:01.09 which broke the 6 year old Tuckahoe record of 2:01.37. "We are so proud of our race and thank our team and Coach Chris Natoli for all of the help and support." said Dryer. Three of the girls of the record breaking relay are swimming for their college in the fall. Robyn Dryer will be swimming for University of North Carolina at Chapel Hill, Christin Swanepoel Stevens will be swimming for Bowling Green State University, and Allison Wells with be swimming for Grand Valley State University. Allison Goldblatt will be a rising junior at Woodson High School. As Highlands Swim coach Dylan Jones darted his gaze between the pool and his watch Saturday morning, his belief that history was about to be made gained steam. His 9-10 girls medley relay team was motoring like never before. Their splits were ahead of target. And, perhaps most promising of all, their anchor leg, Bridget O’Shaughnessy, wasn’t breathing. O’Shaughnessy, 10, didn’t have time to come up for air during her closing 25-meter freestyle leg. She was too busy blazing through what she would later call perhaps the best swim of her life. When she finally lifted her head out of the water, her teammates were joyfully screaming about a dominant seven-second victory over their Chesterbrook counterparts in the event. It wasn’t until a few minutes later that they realized the true magnitude of their performance. The Northern Virginia Swim League 100 medley relay record for 10-and-under girls, Courtney Watts learned, was 1 minute 9.41 seconds, a lightning-quick mark set by Vienna Woods in 1989. The Highlands girls’ time Saturday? One minute 7.70 seconds. “I’ve been around some fast relays before, but I don’t think I’ve ever had a relay demolish a record like that on the first week,” said Jones, now in his 16th year coaching in the NVSL. Highlands Swim fell to Chesterbrook by a final score of 246-174 in Saturday’s season-opening Division 1 showdown, but the Whomping Turtles’ relay record-breakers couldn’t help feeling giddy about crushing the league’s oldest Saturday meter relay record. It was a promising start to the season for a group that has only just begun swimming together. Watts and Hanna Boughanem are newcomers to the relay squad, which placed third at all-star relays last year with Alvarado and O’Shaughnessy. It was also helpful leaving the opening backstroke portion of the race to Watts, who torched the 9-10 girls 50-meter backstroke race with a time of 34.67 seconds, more than three seconds faster than the runner-up finisher Saturday. It was the fastest recorded time in the league on Saturday, just .35 seconds short of Janet Hu’s nine-year-old league mark. Boughanem, Alvarado and O’Shaughnessy rank third, third and second in the league in their respective events. The Whomping Turtles foursome has until July 15 to prepare for the All Star Relay Carnival at Hunt Valley, where they’ll aim to take down the relay carnival record of 1:07.65 set by Mount Vernon Park’s Cassidy Bayer, Holly Jansen, Emma Jones and Julia Hunger in 2010. But the Highlands girls don’t plan on stopping there. “If we can break a minute, that would be cool,” Watts said. Of course, there was more fun to be had around the county during the opening weekend of the NVSL’s 60th summer season. Overlee’s Evan Ingraham burned through a sub-21-second split in the 25-meter breaststroke at McLean, finishing nearly five seconds ahead of the runner-up finisher in the single-lap, 8-and-under boys race. His time sits just .21 seconds off the 35-year-old NVSL mark and makes him just the fifth DMV swimmer in that age category to break the 21-second barrier since 2009. Also making an appearance at the McLean meet was Andrew Seliskar, the area’s top high school swimmer soaking up his final summer league season for the Marlins. Seliskar, a former Jefferson senior bound for Cal next year, took on Ryan Baker, another area standout from Gonzaga High, in a thrilling 50-meter freestyle race Saturday morning. Seliskar, who says he’s got a couple more summer meets left in him this summer, clipped Baker by five-hundredths of a second with a time of 24.03. The NVSL, which carried 15,697 swimmers across 102 teams last summer, saw no individual league records fall over the weekend. Ten meets were decided by 20 points or less. Highlands Swim 9-10 Girls Whomp to New Record! The 9-10 Girls Whomping Turtles - Courtney Watts, Hanna Boughanem, Maria Alvarado, and Bridget O'Shaughnessy - swam a 1:07.70 today in the 100 m medley relay, crushing the oldest Saturday meter relay record. Vienna Woods previously held that record with a 1:09.41, set on July 1, 1989. Join an NVSL pool near you!! The Seeding Committee places the 102 NVSL teams into divisions for the upcoming swim season. Seeding of these teams is a complex, deliberative and in-depth process. Historical data, including meet scores and previous won-loss records, are an important component of the evaluation process. Information provided by the Team Reps and the Division Coordinators is an invaluable component of the seeding process. Each team is measured against every other team in the League. Ultimately, the teams must be in placed in 17 six-team divisions. The goal of seeding is to have the most competitive meets possible in which the final scores are decided in the relays. There are many variables that affect meet outcomes. As a Team Rep, swimmer or parent of a swimmer, you would like your team to be placed in what you perceive will be a winning position for the upcoming season. Every team cannot have a 5-0 or 4-1 season each year. Focusing on individual successes and learning how to win and lose graciously are valuable life lessons which uphold the basic principles of the NVSL. The Riverside Gardens Swim Team, headed by its Concessions board chair, Carrie Garland, made 600 sandwiches in mid-July and distributed the sandwiches to Martha's Table, a District of Columbia non-profit organization dedicated to providing assistance to homeless and low-income children and families. Congratulations to the Tsunami of Riverside Gardens for such an outstanding effort. We are pleased to announce that the 2015 and 2016 Individual All-Star meets have been awarded to Little Rocky Run. The Stingraysand the Little Rocky Run community have a long history of supporitng youth sports in the community and have hosted numerous NVSL Divisional events as well as Individual All-Stars in 2008 and All-Star Relays in 2006. We look forward to great meets at LRR in the next two years. - Tommy Hallock of Fox Mill Woods blazed to a time of 24.03 in the 13-14 Boys 50 Meter Freestyle, breaking the record of 24.24 set by Cabell Perrot of High Point in 2007. - Paul O'Hara of Hollin Meadows recorded an incredible time of 22.60 in the 15-18 Boys 50 Meter Freestyle, bettering his record of 22.94 set last week at Divisionals. - Courtney Watts of Highlands Swim swam a 17.70 in the 8 & Under Girls 25 Meter Backstroke, nearly half-a second better than the old record of 18.18 held by Sinead Eksteen of Shouse Village since 2009. - Johnny Bradshaw reclaimed the record in the 9-10 Boys 25 Meter Butterfly, swimming a 14.36 which beat the record of 14.53 set by Justin Singletary of Fairfax on July 12. And with a time of 1:12.84, Johnny also broke the record he set last week at Divisionals in the 10 & Under Boys 100 Individual Medley. Johnny ends his historic 2014 season as the League record holder in all individual meters events in his age group! - Max Cruz of Holmes Run Acres flew to a time of 28.53 in the 11-12 Boys 50 Meter Butterfly, breaking the record of 28.81 established by Philip Hu of Mosby Woods in 2007. - Peter Makin of Fairfax swam a 1:05.92 in the 11-12 Boys 100 Meter Individual Medley, bettering the mark of 1:06.53 which he set last week at Divisionals. With these 7 records, there were 43 League records broken during the 2014 season, eclipsing the previous high of 30 in 2010. To further put this in perspective, the average total number of records per year since 1998 has been 18. Congratulations to these record breakers and to all of the All-Star swimmers, and a big thank you to Annandale for hosting a great All-Star meet! Paul O’Hara of Hollin Meadows set the record in the Boys 15-18 50 Meter Freestyle with a blazing 22.94, improving upon the record of 22.98 he set last year. Adi Kambhampaty of Chesterbrook established a new mark in the Boys 11-12 50 Meter Breaststroke clocking a 34.21, breaking the old mark of 34.42 set by Matt Stringham of Vienna Woods in 1996. Leo Wang of Virginia Run set a new standard in the Boys 13-14 50 Meter Breaststroke with a time of 30.90, bettering the record of 31.34 set by Chesterbrook's Sam Gollob on July 5. Setting up a showdown at All-Stars, Sam also powered through the 31 second barrier and beat his old record with a time of 30.96. 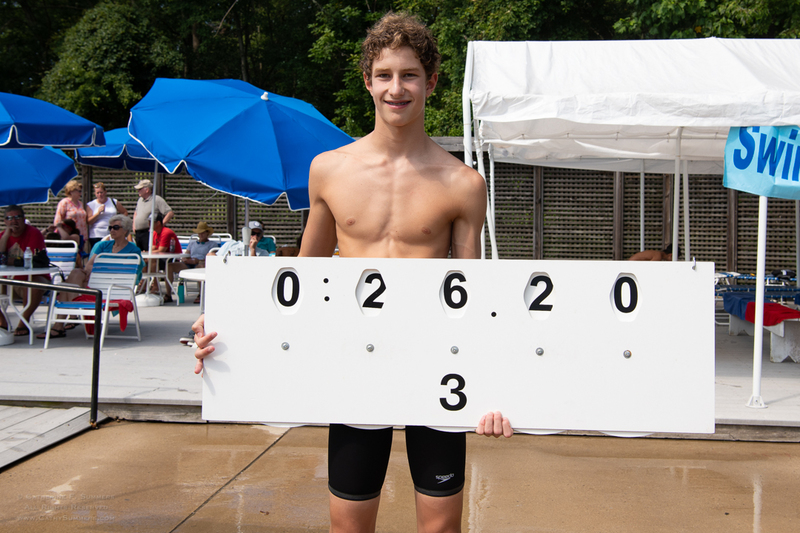 Andrew Seliskar of McLean set 2 records: in the Boys 15-18 50 Meter Butterfly his time of 23.90 eclipsed the old mark of 24.34 set by Sean Fletcher of Hunter Mill in 2009, and in the Boys 15-18 100 Meter Individual Medley Andrew’s jaw-dropping time of 54.85 shattered the old record of 57.12 set last year by Sully Station’s Brandon Fiala. Janet Hu of Mosby Woods flew to a time of 27.30 in the Girls 15-18 50 Meter Butterfly, breaking the record of 27.95 she set in 2011. Johnny Bradshaw of Hamlet absolutely crushed the record in the Boys 10 & Under 100 Meter Individual Medley with a time of 1:12.89, which broke Andrew Seliskar’s 2007 record of 1:15.53 by more than 2 1/2 seconds. Peter Makin of Fairfax clocked a 1:06.53 in the Boys 11-12 100 Meter Individual Medley, bettering the record of 1:08.14 set by Philip Hu of Mosby Woods in 2007. In this same event, Adi Kambhampaty of Chesterbrook also swam under the old record, with a time of 1:07.56. KINGS RIDGE, of Fairfax, received the award for the fourth consecutive year. The award is presented annually to one team in each division that best exemplifies the principles of good sportsmanship as embodied in the NVSL Standards of Conduct. The divisions' teams vote for the award with each team casting three ballots: one based on the vote of the Team Representative, a second based on the vote of their coaches, and a third based on a vote of the 13 & over team members. Congratulations to our 2014 Sportsmanship Award recipients. - Johnny Bradshaw of Hamlet continued his amazing season by setting the record in the 9-10 Boys 50 Meter Breaststroke. Johnny clocked a 37.36 which broke, by 1.3 seconds, the old record of 38.66 set by Rick Eddy of Sully Station in 1995. - Max Cruz of Holmes Run Acres bettered two 11-12 Boys records he set earlier this year on June 28. In the 50 Yard Freestyle, Max swam a 24.15 which dramatically improved his record of 24.95, and in the 50 Yard Butterfly he recorded a 26.31, breaking his record of 26.67. - The Chesterbrook 13-14 Boys made their mark on the record book once again, swimming a 53.76 in the 100 Meter Medley Relay. The team of Grant DeWitt, Sam Gollob, Thomas Outlaw and Jaya Kambhampaty bettered the mark of 53.77 they set on July 5. - The Overlee 13-14 Girls 100 Meter Medley Relay team of Isabella Lee, Kayle Park, Ellie Ridgeway and Lindsey Bowers swam a 58.43, improving the record of 59.20 set by Orange Hunt in 2012. In this same race, Chesterbrook's relay of Julia Green, Claire Wolf, Rachel Clark and Maddie McArthur also swam under the old record with a time of 58.89, but Overlee was faster. - The Chesterbrook 15-18 Boys 200 Meter Medley Relay (Joey Sullivan, Hans Crone, Jake Huber and Christopher Outlaw) blazed to a time of 1:48.52, destroying the record of 1:50.26 set by McLean last summer. Incredibly, in the same race, Overlee's relay of Ryan Baker, Brady Almand, David Emson and Andrew Loranger also swam under the old record by more than 1/2 a second with a time of 1:49.70. So, in the Chesterbrook v. Overlee meet at Chesterbrook, in three consecutive events (Medley Relays for 13-14 Boys, 13-14 Girls and 15-18 Boys) 5 relay teams beat existing NVSL records! Congratulations to all record breakers, and good luck at Divisionals next week! - The Girls 8 & Under 100 Meter Medley Relay team from Tuckahoe (Brooke Thomas, Eli Leonard, Catherine Hughes, Josie Gieseman) swam a 1:17.56, well under the previous mark of 1:19.36 set by Highlands Swim last week. - In the Boys 13-14 200 Meter Medley Relay, the Chesterbrook team of Grant DeWitt, Sam Gollob, Thomas Outlaw, Jaya Kambhampaty continued to re-write the record book, recording a 1:56.06 which edged the record they set last week (1:56.33). Congratulations to these relays for their great performances! And a big Thank You to Hunt Valley for hosting a great All-Star Relay Carnival! With a huge crowd in attendance, the 51st NVSL All-Star Relay Carnival was conducted at Hunt Valley under bright skies and pleasant conditions. The meet kicked off with the presentation of colors by the U.S. Coast Guard, followed by a beautiful violin performance of our National Anthem presented by Jillian Khoo. The times were fast and two NVSL records were set during the 22 event meet. In the team competition, Overlee finished in first place followed by McLean and Chesterbrook. At Intermission, scholarships were awarded to four graduating high school seniors. The MacDuff Scholarship was awarded to Elizabeth Jones of Sleepy Hollow Bath and Racquet. The Presidents' Scholarship was awarded to Rachel Anderson of Little Rocky Run. The Spirit Scholarship was awarded to Jack Capra of Lakevale Estates. And the Joan Olson scholarship was awarded to Cathryn Kost of Pleasant Valley. The Hunt Valley Pool Staff and the many Hunt Valley volunteers are to be commended for their fine effort in hosting our Annual Relay All-Stars meet. The NVSL will return to Hunt Valley next summer for our 52nd annual event. - In his team's home meet against Highlands Swim, Jaya Kambhampaty of Chesterbrook set the record in the Boys 13-14 50 Meter Backstroke with a time of 27.31 which obliterated the old mark of 27.81 set by Philip Hu of Mosby Woods in 2009. - At Cardinal Hill, Justin Singletary of Fairfax set the record in the Boys 9-10 25 Meter Butterfly with a 14.53, improving upon the existing record of 14.58 which was set just last week by Johnny Bradshaw of Hamlet. - Justin Singletary combined with his Fairfax teammates Peter Makin, PJ D'Alessandro and Bryan Lutz in the Boys Mixed Age 200 Meter Freestyle Relay to swim a 1:49.74 which destroyed, by more than 2 seconds, the existing record 1:51.77 set by Chesterbrook in 2013. - Johnny Bradshaw of Hamlet, who has been on a record-breaking tear this summer, improved the record he set earlier this year in the 9-10 Boys 50 Meter Freestyle. At Vienna Aquatic Club on Saturday Johnny clocked a 29.38, lowering the record from 29.59 which he set on June 21. The Girls 8 & Under 100 Meter Medley Relay from Highlands Swim (Courtney Watts, Maggie O'Shaughnessy, Maeve Obrist and Rachel Faino) set a new record with a time of 1:19.36, bettering the mark of 1:22.39 set last year by Overlee. It should also be noted that Tuckahoe's relay of Brooke Thomas, Eli Leonard, Catherine Hughes and Josie Gieseman also beat the old record with a time of 1:19.47, but fell just short of Highlands Swim. Look for a great rematch at All-Stars on Wednesday, July 16! The Boys 11-12 100 Meter Freestyle Relay from Chesterbrook (Adi Kambhampaty, Ollie Bernasek, Nick Spicer and Andrew Bernstein) set a new record with a time of 54.43, beating the old record of 54.56 set by Highlands Swim in 2013. And the Boys 13-14 Relay squad from Chesterbrook (Grant DeWitt, Sam Gollob, Thomas Outlaw and Jaya Kambhampaty) established 2 new records on Wednesday. In the 200 Meter Medley Relay they swam a 1:56.33 which shattered McLean's 2011 record of 1:57.90, and in the 200 Meter Freestyle Relay they clocked a 1:46.69, edging McLean's mark of 1:46.78 established in 2011. Congratulations to all swimmers who made the 2014 Divisional Relay Carnivals an exciting evening, and especially to the record-breaking relay teams! Hamlet's Johnny Bradshaw, who earlier this season set the NVSL record in the 9-10 Boys 50 Meter Freestyle, broke two more records in two different strokes in his team's meet at Lakevale Estates on July 5. In the 9-10 Boys 50 Meter Backstroke, Johnny swam a 33.37, smashing the old record of 34.12 set by Andy Richardson of Virginia Run in 1999. In the 9-10 Boys 25 Meter Butterfly, Johnny swam a 14.58, bettering the mark of 14.67 set by Anthony Grimm of Fair Oaks last year. After three weeks, Johnny is having a truly remarkable season. Meanwhile, the Chesterbrook 13-14 Boys 100 Meter Medley Relay team of Grant DeWitt, Sam Gollob, Thomas Outlaw and Jaya Kambhampaty continued their assault on the record book. Last week they set the record with a time of 54.21, which they bettered with a time of 53.77 at Tuckahoe on July 5. This relay team also holds the 11-12 Boys Medley Relay Records for both Saturday meets and Relay Carnival, and will certainly be setting their sights on the 13-14 Boys 200 Meter Medley Relay Carnival record in the coming weeks. Earlier in this meet, Sam Gollob, while swimming up as a 15-18, set the NVSL record in the 13-14 Boys 50 Meter Breaststroke with a time of 31.34 which bettered the old mark of 31.53 set by Tuckahoe's Carter Flint in 2013. The NVSL Team Representative Meeting originally scheduled for September 14 has been moved to one week later. It is now rescheduled for Sunday, September 21, 6:30 pm, at Mason District Government Center. 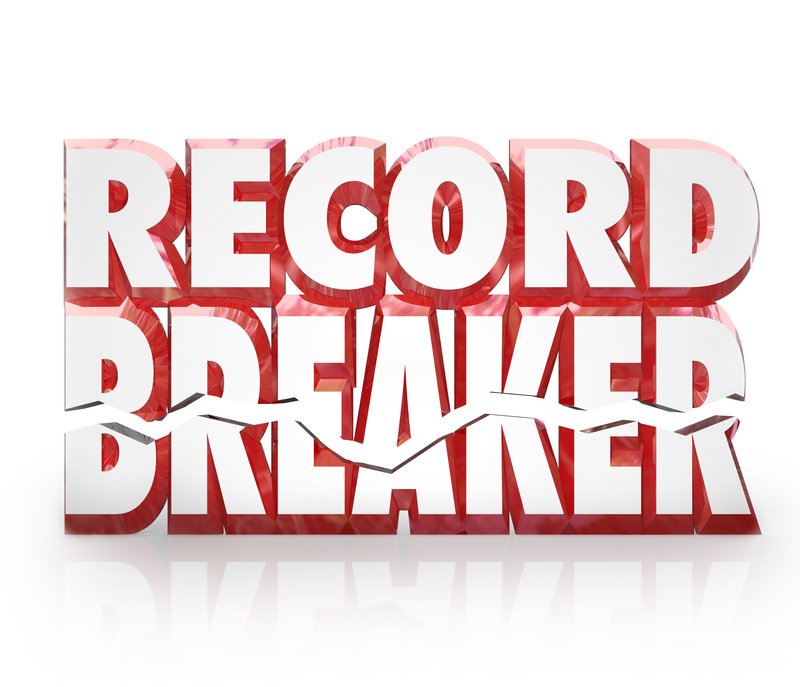 The second Saturday of dual meets saw nicer weather and an incredible SEVEN new NVSL records, three of which broke records that were more than 30 years old! John Paul Gonsalves of Kent Gardens set the records in the Boys 8 & Under 25 Yard Backstroke with a time of 16.69 (old record 17.50 by Bret Cade of Orange Hunt in 1975) and 25 Yard Butterfly with a time of 16.30 (old record 16.70 by Max Cruz of Holmes Run Acres in 2010). John Paul’s records were set at Kent Gardens. Max Cruz of Holmes Run Acres set the records in the Boys 11-12 50 Yard Freestyle with a time of 24.95 (old record 24.96 by Andrew Revers of Mansion House in 2013) and 50 Yard Butterfly with a time of 26.67 (beating his own record of 27.03 set last week). Max’s records were set at Holmes Run Acres. Jacquee Clabeaux of Greenbriar set the record in the Girls 13-14 50 Yard Breaststroke (while swimming up as a 15-18) with a time of 31.65, bettering the old record of 32.20 set by Gretchen Wasserstrom of McLean in 1983. Jacquee’s record was set at Holmes Run Acres. The Tuckahoe 8 & Under Girls 100 Meter Freestyle Relay of Patricia Leonard, Josie Gieseman, Brooke Thomas and Catherine Hughes set a new Saturday Meet NVSL record of 1:10.35, beating the old record of 1:11.80 set by Cardinal Hill in 1983. This record was set at Tuckahoe. The Chesterbrook 13-14 Boys 100 Meter Medley Relay of Grant DeWitt, Sam Gollob, Thomas Outlaw and Jaya Kambhampaty set a new Saturday Meet NVSL record of 54.21, bettering the old mark of 54.85 set by McLean in 2011. This record was set at Chesterbrook. Congratulations to all our record breakers! Congratulations to Johnny Bradshaw of Hamlet and Max Cruz of Holmes Run Acres, who each set new NVSL records in the first dual meet of the season. In Hamlet's home meet against Fairfax Station, Johnny shattered the 30 second barrier with a time of 29.59 in the 9-10 Boys 50 Meter Freestyle, eclipsing the previous record of 30.16 set by James Murphy of Little Rocky Run in 2008. Meanwhile, swimming against Dowden Terrace at Holmes Run Acres, Max established a new mark in the 11-12 Boys 50 Yard Butterfly with a time of 27.03 which bettered the old record of 27.96 set in 2005 by Little Hunting Park's Blake Sundel. With his swim today, Max now owns the butterfly yards records in three age groups - 8 & under, 9-10 and 11-12! The League has received Johnny's and Max's signed time cards, so both of their records are now official. Great swims Johnny and Max! Welcome to the new NVSL website, <mynvsl.com>. The development and launch of this site is the result of work by a dedicated group of volunteers over the past year. NVSL Swimming and the League thanks LightMix Design of Vienna, VA for the development and launch of the new site and Marlin Design of Falls Church, VA for the website design. Please check our NVSL Diving by clicking the tab to the left of our logo at the top of this page.